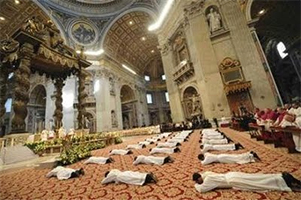 By virtue of the sacrament of Holy Order, priests are given a sacred power (sacra potestas) to act in total sacramental identification with Christ (i.e., to act in persona Christi) in order confect Christ’s Body and Blood at the Holy Sacrifice of the Mass; to forgive sins through the Sacrament of Penance; to solemnly baptize; to preside during the sacrament of Holy Matrimony; to offer Holy Anointing (Unction) to the dying; to preach; and to otherwise teach, guide, and sanctify the faithful. As in Baptism and Confirmation, the Sacrament of Holy Orders leaves an indelible mark on the soul of the recipient and can never be erased or repeated once validly received; once a priest, always a priest. Assistant Vocations Director: Rev. Damien Lynch (Tel: 024 92456).